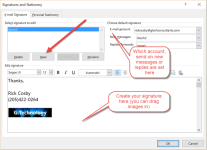 Note Outlook for Android requires a device running Android 4.0 or later. App availability also varies by country. Find out what’s available in your country. If the app is incompatible with your device, you can add your mail account by using the mail app that comes with your device. 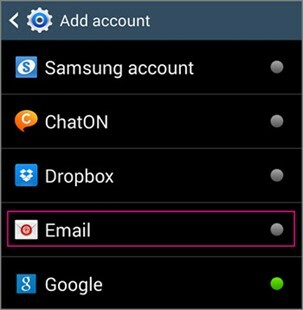 See Set up email using the Android mail app. > Settings > Add Account. Tap Outlook.com if you have an Outlook email account ending with @outlook.com, @hotmail.com, @msn.com, or @live.com. Note This includes international domains, such as @outlook.co.uk, or any custom domains hosted on Outlook.com. Tap Exchange if you have a work or school account in Office 365 for business or another Exchange-based mail account. Tap one of the other options if you have a different mail account. For example, tap Gmail if you want to add a Gmail account. Enter your full email address, for example tony@contoso.com, type your password, and then tap Sign in. > Help. Or, use your browser and go to Frequently asked questions about Outlook for iOS and Android. Type your full email address, for example tony@contoso.com, type your password, and then tap Next. 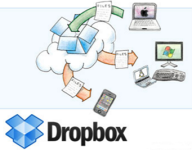 Exchange Server Use the address of your Exchange server. If you aren’t sure what your server address is, check with your administrator. The server for Office 365 for business is outlook.office365.com. Do you have Outlook for iOS installed on your device? 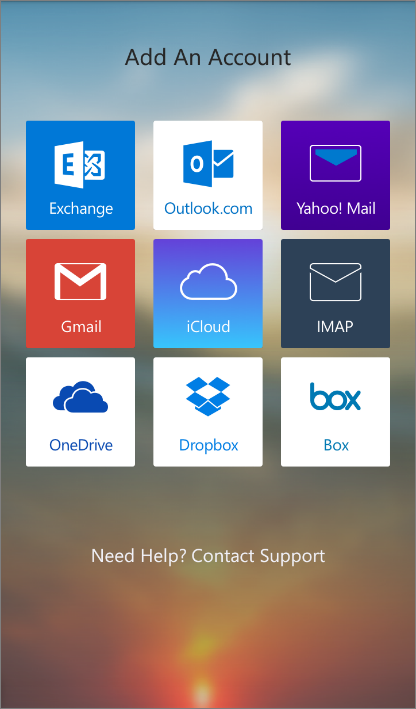 If it’s not installed on your device, download Outlook for iOS from the App Store. Open the app. If you want an introduction, tap Product Tour, or tap, Get Started. Tap Exchange if you have a work or school account in Office 365 for business or another Exchange-based mail account. 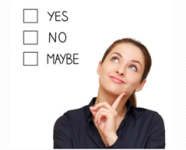 This is the choice if we set up your account. 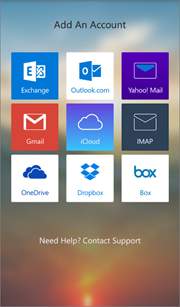 To learn more about using Outlook for iOS, tap the navigation control at the bottom of your device, or tap More > Help. Or, use your browser and go to Frequently asked questions about Outlook for iOS and Android. Tap Microsoft Exchange for your work email account. You don’t need to type anything in the Domain box. Type the information requested in the Email, Username, and Password boxes. You need to type your full email address in the Email and Username boxes (for example, tony@contoso.com). Tap Next on the upper-right corner of the screen. Your mail program will try to find the settings it needs to set up your account. Go to step 8 if your mail program finds your settings. Office 365 autodiscovers here and you do not have to enter the servername most of the time. If your iPhone can’t find your settings, use outlook.office365.com for your server name. In the Server box, enter your server name, and then tap Next. If you’re prompted to create a passcode, tap Continue and type a numeric passcode. If you don’t set up a passcode, you can’t view your email account on your iPhone. You can set up a passcode later your iPhone settings. 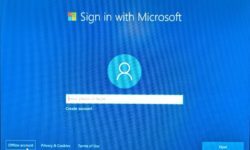 If you want contacts created on your phone to sync back into outlook, then you need to insure that the correct account is selected as the default location for contacts. Make sure that the exchange account you created above is selected to be the Default account under Contacts. You should delete the old account since it will no longer be available. All of your older emails will appear in the new account although it may take some time for them to sync back up.